Special blood used in ministration. Restores HP. the first, and are all the more invigorating for it. 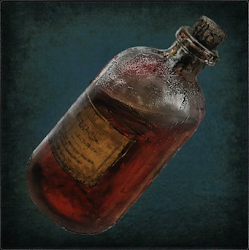 Blood Vials are your primary source of healing in Bloodborne. They are assigned to the TRIANGLE button; there's no need to equip them in your quick inventory. You can hold a maximum of 20 by default, though this can be increased by equipping Communion Runes. If number is blue (HUD) it means you have reached maximum Blood Vials you can hold [pic]. Blood Vials will heal you for 40% of your maximum HP. They are very quick to use, too, and you can move a little while doing so. Be careful not to use too many, though, Bloodborne's Regain system is intended to help you heal without the use of Blood Vials, and it's easy to run out of Blood Vials if you don't make use of Regain at all. You can always buy more, but it's a waste of Blood Echoes that could be used for leveling up. The Blood Vials in your inventory are replenished when you warp, but they are taken from your stock. These are not free refills. If you run out of Blood Vials in your stock, your inventory won't be replenished You'll need to collect or buy more. When player dies or warp to new the area Blood Vials replenish to maximum held from available vials in the Storage. Healing button is permanently mapped to Triangle. Maximum number of hold vials can be increased by using Communion Caryll Runes. Amount of healed HP can be increased by using Radiance Oath Caryll Rune.